A rescue team searches for Eugene, unaware of the disturbing new danger from a seemingly intelligent herd. Michonne and the new group arrive in Hilltop, and Henry makes some new friends. Last edited by GateWorld; November 28th, 2018 at 10:59 PM. Okay so there's definitely some beef between Alexandria and Hilltop. It looks like Michonne is at the center of it, possibly a war between the two factions? I base this on the nasty looks they exchanged when she brought in the new ''refugees''. There's a herd going in circles... the whisperers? Last edited by Chaka-Z0; November 26th, 2018 at 04:08 PM. Loved this episode! Feels like the good old days! The Walkers are something to be feared again, never being sure if it's a Walker or Whisperer. Seeing that first Whisperer duck and spin at Jesus was so creepy, even though we knew it was coming I was still taken aback. I hope they fill us in soon on what happened between the communities, I would imagine at some point they will have to work together again. This was a really beautifully shot episode. The whole section of the episode in the fog with the thunderstorm rumbling in the distance, first in the field and farmhouse, then later on in the graveyard, was just amazingly spooky. You don't get that kind of scary from TWD much anymore and I thought it was really welcome here. And the 'walker dodge' moment, wow. I knew the Whisperers were coming, but that was still a major "holy sh*t" moment, the first in a few years. Very very sad to see Jesus die though (seriously, WHY). And the 'walker dodge' moment, wow. I knew the Whisperers were coming, but that was still a major "holy sh*t" moment, the first in a few years. Oh yea the dodge was beautifully shot, all happening in a graveyard too. 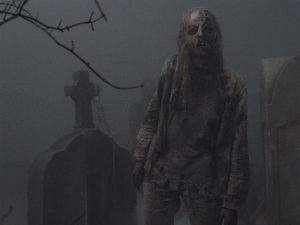 I can't remember the last time I saw TWD as a horror, but this was one of the best, if not the best episode of all time. Anyone catch what he whispered to Jesus before slaying him? Very very sad to see Jesus die though (seriously, WHY). Dude it was inevitable, it's in the Bible duh. Honestly, I had the gut feeling that it was coming very shortly. I knew it was coming simply because they seemed to put a lot of emphasis on him in the past episodes, but primarily because Jesus groomed Aaron in combat. That was a dead giveaway for me. TWD has to be the show which I least care about its characters to be honest, they're even worse than GoT... Like I don't even care much that Lincoln left the show, and as a matter of fact I think it's a good thing seeing where they are headed with the show! I believe it was "you are where you don't belong." Dude it was inevitable, it's in the Bible duh. Is that the midseason finale? Yes it was, second half begins in February. Don't worry, he'll be back in three days. Tom Payne wanted out that's why Jesus got it, aparantly he is a big comic fan and did lots of training in preparation for the role, only to be sidelined by a useless show runner, by the time Kang took over, it was too late and the damage had been done driving Lincoln, Cohan and Payne away. The second coming of Christ? Jesus walks the Earth again hungry for blood and flesh? I did see on TV that he trained intensively in martial arts, dedicated guy he is. I don't blame most of the cast, they've been doing it for almost 10 years and maybe want to do something else. I had lost all hopes for the show, but 908 renewed my hope, looks like they're finally going back to the horror route instead of drama BS every episodes. I wonder whether the second half is going to rush into the Whisperer War or if they’ll build up and end the season on the ‘border’ moment. Shhh!! Some of us didn't read the comics! Okay I needed to get this off my chest, I just couldn't stop laughing yesterday. I was literally folded in half. Was watching Talking Dead on demand since I missed it, and during the commercial break this ''Thank you Andrew Lincoln'' event kept playing. So basically, you've got an over-the-top dramatized compilation of fans expressing their love for Lincoln. A few quotes from the add below, for your pleasure. There's this couple talking about how much they love Rick, well, the wife is and you should SEE THE HUSBAND'S face OMG I'm dying, he really has that *What the F**K am I doing here* face. I find this whole fanworship so cringy I can't help it sorry. Anybody else agrees or am I just a snob for laughing at these fanbois? Hey I was making an effort to be opaque! I know you guys are well informed. Did I hear correctly when they mentioned Gimple isn't involved in the show anymore? Not day-to-day, no. At the end of Season 8 he was promoted from showrunner to ‘chief content officer,’ meaning that he doesn’t deal with the individual minutiae of any single part of the AMC TWD franchise, but he controls the overall direction. Starting with Season 9, staff writer Angela Kang became showrunner on the main TWD series. From what we’ve heard, she, whoever it is that’s running FTWD, whoever is running the movies, they all have free reign day to day. But Gimple checks in on all of them fairly regularly to make sure the franchise as a whole is moving in the same direction and coordinating effectively. I know that you can't get too comfy with any characters in TWD, but honestly never saw that coming! Oh man! I totally agree that the episode was beautifully shot; very atmospheric - in fact almost felt like a whole different show! I don't recall seeing anything like it from TWD - almost felt like Buffy or something (but better). I too am not a comic reader, so it's kind of fun tagging along here, with people who have some idea what to expect, and getting these glimpses of the future, but of course it's never exact, especially now things have diverged so far from the comics. When Negan found his cell door open, I half expected him not to actually walk out... Very curious to see what happens there! Frankly what I'm seeing so far excites me - as noted elsewhere I think he should be the figure that assumes the mantle left by Rick, and with Maggie gone, I feel that's almost possible. I certainly still do not see Daryl being the "prime".